Fuxoft's Blog: Say no to politically correct fairy tales! This might seem like a joke but it's really true. While in the bookstore, I saw nicely illustrated children's book "Little Red Riding Hood". I picked it up nostalgically and flicked through the pages (less than 20 in total) to be shocked. The whole plot was "slightly changed": No one gets eaten at all and, in the end, grandmother and Little Red are discovered hiding in the closet! What the hell is that? I don't want this crap for my (future) children. I want blood and freudian symbolism! 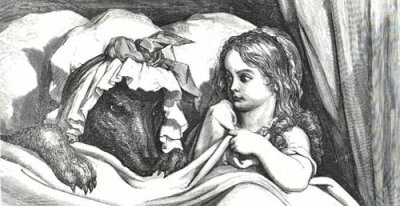 To calm myself, I immediately had to visit SurLaLune fairy tales page, read the original version(s) and excellent analysis of this and other fairy tales. Bring back Brothers Grimm and Andersen! now that is something that makes me worry... everything is more and more politically correct, there is a great influence of media on children and, maybe it will sound quite paranoic, but i really feel that this influence is used to raise them into just-another-consumer, supporting system, *insert random conspiracy thory here*. Btw have you seen those new episodes of "A je to!" series? How can someone possibly ruin such great topic like DIY? I mean its no problem tu make it both politically correct *and* funny, but it is NOT FUNNY AT ALL! Most boring thing after Shatks Tale I have ever seen it is... *sigh* its just ...balance in the world is lost. Humanity will collapse in next 300 yrs. Somehow it will. I haven't seen the new "A je to". What about it?! Mistakes that Pat and Mat do are just pure stupid, not like in the old ones, which reminds me how I was building thing when I was a small kid. In one of the new episodes they see some bird in TV and decide to build a glider So they actually build in in the room. Now there is problem number one - glider looks pretty OK to actualy fly! That is becouze new "a je to" is made by teh czeks not SLOVAKS. SLOVAKS make the olders htat was funny! SLOVAKS is best!